What is the max workers comp benefit rate in DC? 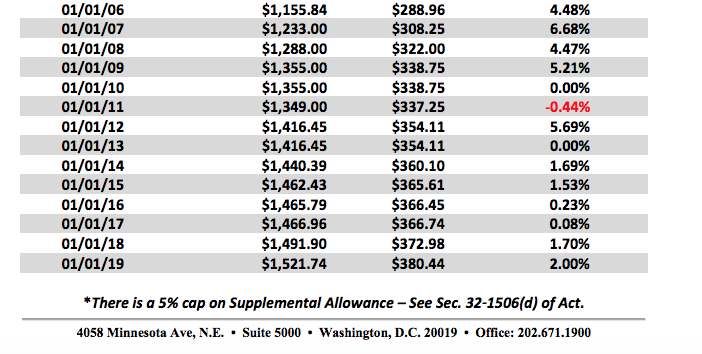 Pursuant to the District of Columbia Workers' Compensation Act of 1979, D.C. Official Code,§ 32-1505, effective January 1, 2019, the maximum weekly compensation payment for the District of Columbia private sector workers' compensation claims is $1,521.74 The minimum weekly compensation payment is $380.44. That is a 2% increase from last year. Looking for more info on Maximum Compensation Rates for DC Workers' Compensation over they years? Are you wondering what type of compensation rates you might be entitled to for your work injury? Have you heard terms floating around like permanent partial disability PPD or permanent total disability PTD? Don't wonder any more. Call us! We always make sure that our clients are getting paid the highest possible rate (if you have more than one job, check out this article on wage stacking). Don't wait until you've already screwed up your case. It is possible to get too far down the line and the insurance adjuster will pull out their bag of tricks if you are unsuspecting. Call us at 202-393-3320 today.